The Jaguar XK120 was a sports car manufactured by Jaguar between 1948 and 1954. It was the first post-war sports car from the marque, succeeding the SS 100 which ended production in 1940 after the start of World War II in Britain. The XK120 was launched at the 1948 London Motor Show as a test bed and show vehicle to highlight the new Jaguar XK engine. The car caused a sensation, which persuaded William Lyons to put it into production as a standard model. The first cars manufactured in 1948 and 1949 had hand built aluminium bodies on an ash frame. Jaguar built 240 of these alloy bodied cars prior to moving to a more mass production XK120 in order to meet the demand for this popular model. With the 1950 model year a production version had a steel pressed body with alloy doors, bonnet, and trunk skin. Other features included torsion bar front suspension, and a removable windscreen. Power came from a dual overhead cam 3.4 L straight-6 engine, Jaguar's famous XK engine. With an alloy cylinder head and twin side draft SU carburetors, the XK engine was very advanced for a mass produced unit, developing 160 bhp with the standard 8:1 compression ratio. A 7:1 low compression version of the engine was also available to cope with low quality fuel. This same basic design of the XK engine was used in 3.8L and 4.2L versions into the late 1980s. The XK120 name referred to the vehicle's impressive 120 mph (193 km/h) top speed - even faster with the windscreen removed - and at the time of its launch it was the world's fastest standard production car It was available as a coupé (FHC or Fixed Head Coupe, introduced in 1951), convertible (DHC or Drop Head Coupe, 1953), or the original roadster (OTS or Open Two Seater). An XK120 FHC can claim the first import win in NASCAR when it won NASCAR's first road race at Linden Airport, New Jersey, June 13th, 1954 with Al Keller at the wheel. Earlier in the year, on 31 January / 1 February, an XK120 Coupe driven by Mrs D Anderson, Chas Swinburne and Bill Pitt had won the first 24 hour car race to be held in Australia, the 1954 Mt. Druitt 24 Hours Road Race. The Roadster had a very light weight canvas top and removable side curtains screwed to the doors, which had no external handle - to open them you reached through the screen to pull a cord on the inside. It also had a windscreen which could be removed so that "aeroscreens" could be fitted. The DHC or Drop Head Coupe had a padded top and roll up windows. Both the FHC and DHC had an elegant wood veneer dash, whereas the roadster's was leather. All models were manufactured with spats to cover the back wheel arch which enhanced the streamlined look, but when optional (from 1951) wire wheels were fitted, the spats had to be removed to make room for the hub spinners. There was also an M version (called SE for Special Equipment in England) which included increased power, stiffer suspension, dual exhaust, and wire wheels. An OTS roadster with all weather gear in place tested by The Motor magazine in 1949 had a top speed of 124.6 mph (200.5 km/h) and could accelerate from 0-60 mph (97 km/h) in 10.0 seconds. A fuel consumption of 19.8 miles per imperial gallon (14.3 L/100 km/16.5 mpg US) was recorded. The test car cost £1263 including taxes. This one was a real surprise to me (as much because I don't keep up), and when I saw it, I knew it had to be mine. Besides, it was reasonably priced. A look at the bits turned up a 1979 Monogram molding imprint, adding even more surprise. I had no idea that this was an old Monogram mold as it looks as if it had been done quite recently. A closer look at the parts showed a tad bit of flash and a somewhat 'soft' imprint that we would not expect from a new kit. Like their aircraft kits, a ©MMI 1979 is proudly embossed right where everyone can see it if the turn the model upside down. 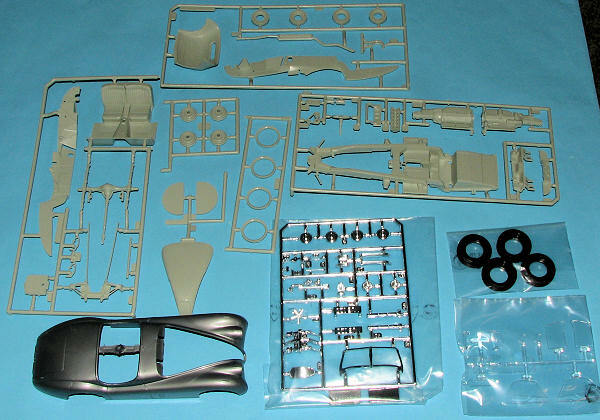 The one-piece main body is molded in silver with the rest of the bits in a greenish grey plastic that reminds me of many old Revell aircraft kits. There is a large mold line down the side of the body that will have to be removed, but it looks pretty basic. Chrome pieces are very well done, but most modelers will de-chrome it anyway as removing the sprue attachment nubs will eat into visible chrome areas on the headlights and windscreen frame. The clear parts are a bit thick and provide front windows. The side curtains are also molded clear as is a back window for the convertible top. Two small half-moon racing windscreens are also provided. Other details include a complete but somewhat basic engine, separate chassis components and exhaust as well as the option to have the car right or left hand drive. In this regard there are a number of holes to be drilled and component placement that is different regarding the steering and foot pedals. Vinyl or rubber tires are part of the kit as well. Oh yes, the hood opens to show off the engine. Instructions are typical Revell AG with well done construction drawings and detail information as needed. The only decal options are license plates and the small, well printed sheet also includes instrument faces. As for colors, well, there is no exterior painting diagram at all. 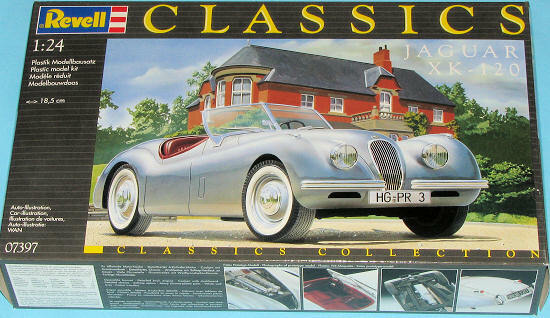 The box art shows a Silver one with red leather interior, though you could paint things any way you wish. I'd keep the colors subdued if doing a period car as a bright red or yellow Jag just wasn't done. A web search will turn up a number of options should you so be inclined. Though not a new mold, the kit is, nonetheless, most welcome to those of us who like older sports cars and especially ones as cool as the Jaguar. I saw it and thought you'd appreciate my sharing with you so bought it.